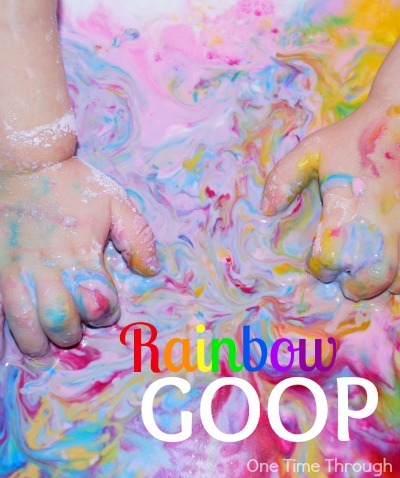 The rain outside today has got me thinking about rainbows and activities to brighten up a ho-hum day. 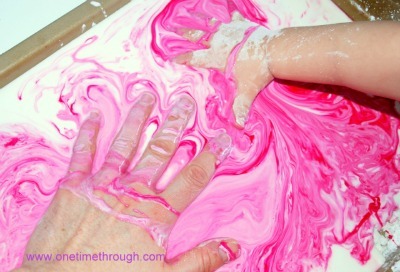 This is a great indoor activity to do with your child. SO MUCH FUN!!! 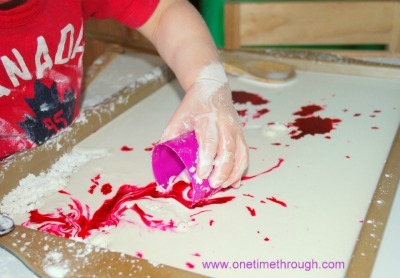 You DO have to be a bit brave – and not afraid of a little mess… but you wouldn’t let that scare you away from a fantastic experience for your child right!!!!? 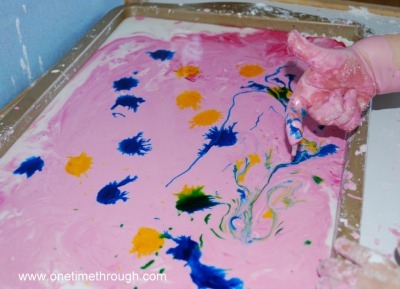 All you need is one box of cornstarch, food colourings, and water. You will also want a cookie tray to contain the mess! Dump the cornstarch in a bowl and very slowly add between 1/2 cup to 1 cup of water, stirring as you go. Onetime (my 2.5 year old son) L-O-V-E-D this stuff! But I can’t see any kid NOT enjoying himself. I had a ton of fun too! Oh, and yes, this IS a picture of my son after dipping his face in the stuff. I believe my husband said, “WHAT the heck happened to his FACE!? !” when he saw the remnants of the blue food colouring on my son’s nose a couple of hours later. 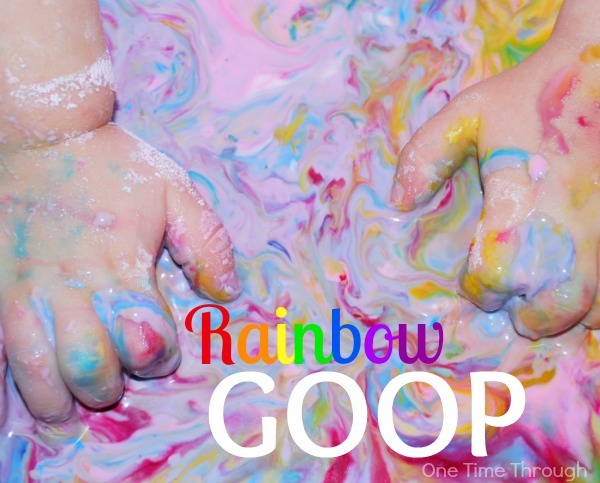 Great sensory experience – and adding the different colours one at a time really helped us see how the GOOP moved and worked (not to mention made a nice little side lesson on colour mixing!) And when added gradually – led to a really neat swirly rainbow effect! I found this recipe in an old collection of camp counselling ideas that I had held onto from my early 20’s. I can’t believe I hadn’t tried this before! Onetime played with this stuff for OVER an HOUR! And from a personal perspective, I love the beautiful photos I caught of the colours! This will definitely become a regular on our activity rotation! What do you think? Are you going to try it? Do you DARE??? This looks so amazing! Can’t wait to give it a go myself! We BOTH had fun for sure! Hope you do too! We do this at least every year – the kids love it! – but we hadn’t done the color mixing yet. It looks beautiful! Soo pretty! I think I might have to frame some prints! Glad you’ve got something new to try! So fun! 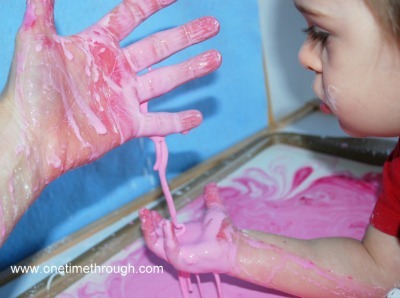 Love messy play! Pinned. Thanks for sharing. Yes – definitely messy – but worth it! Thanks for dropping by Crayonboxchronicles! 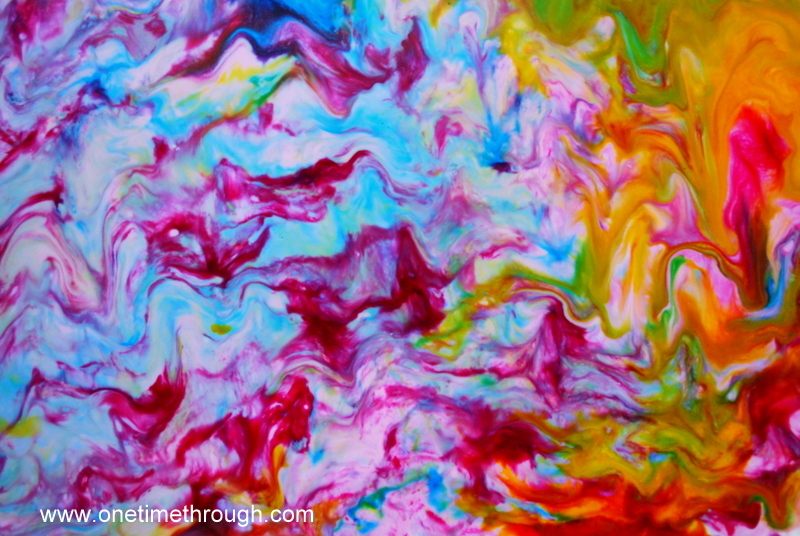 I’m always nervous about using food coloring – but this looks like too much fun! We’ll *have* to give it a try! Yep – I get it. Just spoiled my favourite t-shirt yesterday with a drop from a project. I guess I need to wear a paint smock like my son! Have fun and thanks for dropping by Emma!